A Financial Tsunami is Heading Toward Us! 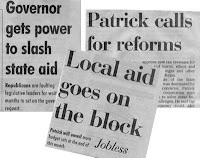 These headlines are from this past week’s Springfield Republican (week of January 12, 2009) and highlight the continuing fiscal crisis facing the the state of Massachusetts. The news stories highlight that there is an need to cut another $1 billion (vs. total budget of $28.1 billion) by the end of January from the fiscal 2009 budget because of shrinking tax collection revenue. This is in addition to the $1 billion worth of cuts already imposed last October which did not include aid to cities and towns. A total of $2 billion of cuts in the current FY09 ending on June 30 are needed. This past week the state legislature gave Governor Patrick the authority to cut state aid to cities and towns but limited it to cuts of $500 million for the current fiscal year. Gov. Patrick’s new authority is also somewhat limited when it comes to cutting general education for a single school district. He cannot cut it to less than the “foundation budget” which is what the state calculates is the minimum $$ needed to educate students. While I do not know what the current foundation budget is for Longmeadow schools, I suspect that it is much lower than the current school budget so the budget cut limitation is not going to protect our state aid for Longmeadow schools which is currently $6.2 million. Here is a possible scenario that is very scary…. In the current FY2009 the state budget is providing a total of $5.3 billion in local aid to cities and towns. Cuts of $500 million to cities and towns represent a 9.4% cut ($500 million/ $5.3 billion). For Longmeadow this might translate to state aid cuts of $367,000 for schools and $216,000 for the town- a total of almost $600,000! Given that the FY2009 is more than half completed, reductions of this size would be very difficult and result in a significant reduction of town and school dept services. If there was significant free cash available to reduce this unanticipated deficit, then the FY2010 budget would be significantly impacted. What are town leaders (Select Board/ Town Manager + School Committee) doing right now to prepare for the tsunami wave that has already been formed in Boston and is heading west towards us? Let's hope that for some reason that this financial tsnami is deflected and heads in a different direction! We should know by the end of January!